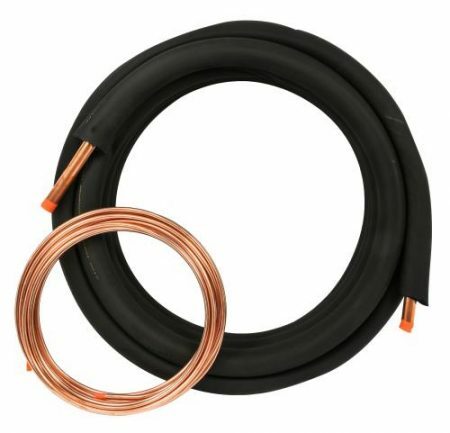 ReFlex line set are used to simplify installation of HVAC split system equipment. 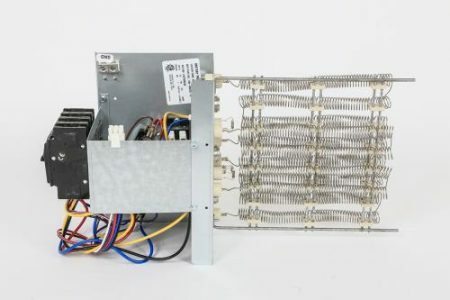 Connecting the indoor evaporator along with the outdoor condensing unit, this system allows an easy installation with out the headache of kinking copper tubing and saves on install time and labor. The ReFlex line set comes pre-wired, pre-insulated, and also comes with flare fitting on both ends, with a ETL listing for 800 psi pressure test. For use with the DriFecta Mega-Split Air Conditioners. 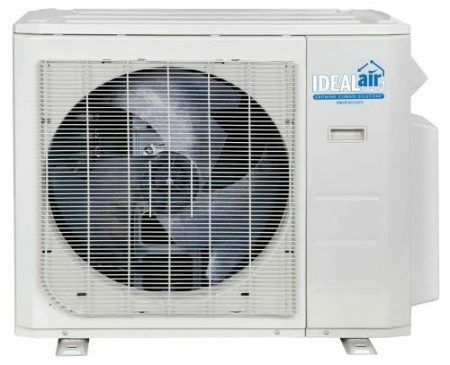 Ideal-Air 5 Ton 14 SEER Split Complete System Air Conditioner Package. 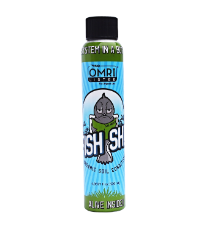 This system features internal compressor protection and includes a factory installed filter drier to keep the refrigerant clean and dry on the outdoor unit for years of use. The single piece, 24.5 inch wide multi-position air handler is fully insulated to reduce noise and prevent sweating and includes a horizontal condensate drain pan. 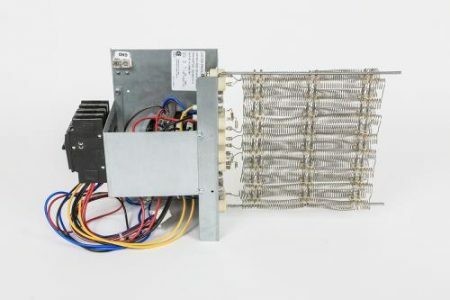 Included indoor evaporator coils are “compatibility engineered” and an ECM Motor (X13) motor standard for efficiency. The blower delivers 2000 CFM to accommodate large duct work and a matched TX valve is included with every system to ensure maximum efficiency. If extra heat is desired, back-up electric heat is also available (Strip heaters are optional and sold separately). All systems are 208/230 volt, 1 phase, 60Hz. As always R410A environmentally friendly refrigerant. A 10 year compressor and 1 year all other parts warranty is standard when registered and serviced. 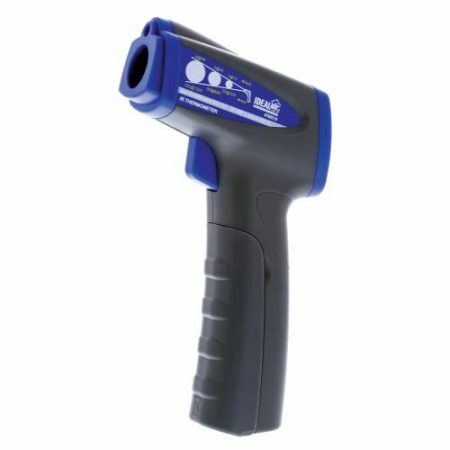 Ideal-Air Infrared Thermometer determines the temperature of objects from a distance. The Infrared Thermometer consumes very little power (9 volt battery) and helps users to measure temperature quickly and accurately. The Ideal-Air non-contact Infrared Thermometer is capable of confirming the surface temperature by measuring infrared energy radiated from the targeted surface. 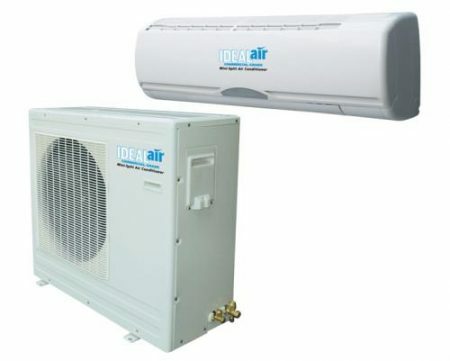 Ideal-Air Line Sets are required for installation of the Ideal-Air 5 Ton Split System (701706). 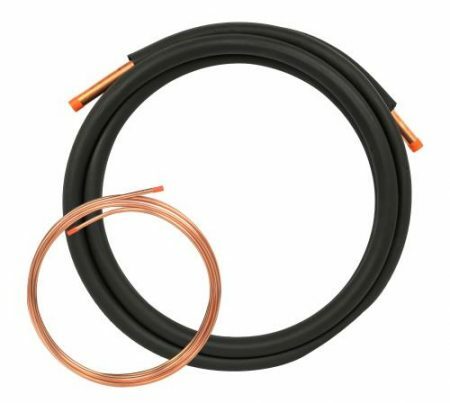 The Ideal-Air Line Set is insulated copper refrigerant line. Tube diameters for both 700813 and 700814 are 1-1/8 in and 3/8 in. 700814 is 25 feet long and 700813 is 50 feet long. NOTE: Copper Reducer Coupling is required for line set installation. Must be purchased separately – item 700812. Can be used with the optional programmable thermostat 700520, and requires a remote thermostat cable 700521, with up to 4 temperature settings each day. Flexible stainless steel 23 ft pre-charged line set with quick connect fittings to allow for easy Do It Yourself installation. No technician required. High energy efficiency: 15 seer using advanced DC inverter compressor. Mini-Split inverter technology offers up to 30% energy savings. Auto restart after power failure. Ambient air temperature and individual room conditions will affect performance. Must have a dedicated power circuit. One year warranty. Product No. 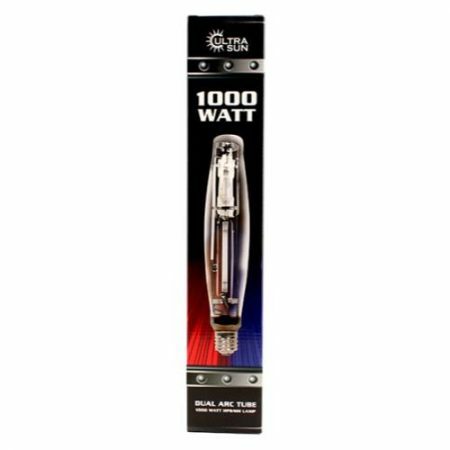 700500 features: Amp range: 2 to 14 amps. dB Rating: Indoor 32 dB, Outdoor 45 dB. Requires 120 volt dedicated 20 amp circuit. Product No. 700505 features: Amp range: 6 to 14 amps. dB Rating: Indoor 35 dB, Outdoor 45 dB. Requires 240 volt dedicated 20 amp circuit. Product No. 700510 features: Amp range: 8 to 30 amps. dB Rating: Indoor 42 dB, Outdoor 52 dB. Requires 240 volt dedicated 30 amp circuit. All Ideal-Air air conditioners need surge protection and a dedicated power circuit. In the event of a power failure, a spike in power may occur when the power is reinstated. This can damage the circuit board which is not covered under warranty. 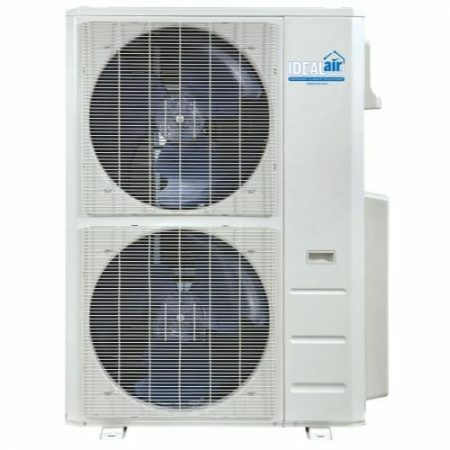 Ideal-Air Pro series 24,000 BTU 16 Seer Heating & Cooling Mini Split to include 1 indoor unit and 1 outdoor unit, these are high efficiency performance at 16 SEER. They have inverter compressor technology offering 30% – 50% energy savings. The indoor evaporator unit can be easily installed with included wall mount bracket. Includes LCD screen hand held programmable remote controller. Auto restart after power failure. Requires certified HVAC-professional installation. Requires field supplied electrical and communication wiring. A copper refrigerant lines sold separately. The line set diameters 3/8 inch and 5/8 inch, 208/230V, 1 phase, 25 Amps, 2425 watts, Outdoor Ambient operating range: (Cooling = 5° to 122°F), (Heating = 5° to 86°F). 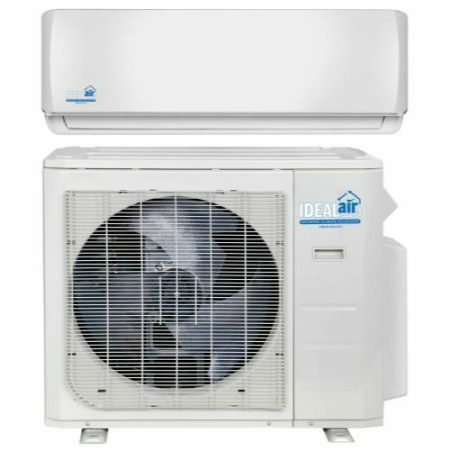 Ideal-Air Pro series 36,000 BTU 16 Seer Heating & Cooling Mini Split to include 1 indoor unit and 1 outdoor unit, these are high efficiency performance at 16 SEER. They have inverter compressor technology offering 30% – 50% energy savings. The indoor evaporator unit can be easily installed with included wall mount bracket. Includes LCD screen hand held programmable remote controller. Auto restart after power failure. Requires certified HVAC-professional installation. Requires field supplied electrical and communication wiring. A copper refrigerant lines sold separately. The line set diameters 3/8 inch and 5/8 inch, 208/230V, 1 phase, 35 Amps, 3835 watts, Outdoor Ambient operating range: (Cooling = 5° to 122°F), (Heating = 5° to 86°F). Ideal-Air Pro-Dual 12,000 BTU Multi-Zone Heating & Cooling Ceiling Mount Cassette with grill. The Ideal-Air Pro-Dual Indoor Head unit can me matched up with multiple different configuration with 1 single outdoor condensing unit. (See Match up chart online at www.ideal-air.com, this will also be listed on the packaging of the box). 208-230V, 60Hz, 1ph, 3 speed fan, 35 dB sound rating, 15 Amps and 46 watts. Line set connection 1/4 x 1/2 inch. Ideal-Air Pro-Dual 12,000 BTU Multi-Zone Wall Mount Heating & Cooling Indoor Head. The Ideal-Air Pro-Dual Indoor Head unit can me matched up with multiple different configuration with 1 single outdoor condensing unit. (See Match up chart online at www.ideal-air.com, this will also be listed on the packaging of the box). Maximum cooling area up to 252 sq. ft. 3 speed fan, 25dB sound rating, 208-230V, 60Hz, 1ph, 0.25 Amps 20 watts. Line set connections 1/4 x 1/2 inch. Ideal-Air Pro-Dual 18,000 BTU Multi-Zone Heating & Cooling Ceiling Mount Cassette with grill. The Ideal-Air Pro-Dual Indoor Head unit can me matched up with multiple different configuration with 1 single outdoor condensing unit. (See Match up chart online at www.ideal-air.com, this will also be listed on the packaging of the box). 208-230V, 60Hz, 1ph, 3 speed fan, 41 dB sound rating, 15 Amps and 46 watts. Line set connection 1/4 x 1/2 inch. Ideal-Air Pro-Dual 18,000 BTU Multi-Zone Wall Mount Heating & Cooling Indoor Head. The Ideal-Air Pro-Dual Indoor Head unit can me matched up with multiple different configuration with 1 single outdoor condensing unit. (See Match up chart online at www.ideal-air.com, this will also be listed on the packaging of the box). Maximum cooling area up to 368 sq. ft. 3 speed fan, 34.5 dB sound rating, 208-230V, 60Hz, 1ph, 0.40 Amps and 58 watts. Line set connections 1/4 x 1/2 inch. Ideal-Air Pro-Dual 24,000 BTU 22 Seer Multi-Zone Heating & Cooling Outdoor Unit. The Ideal-Air Pro-Dual Outdoor unit can me matched up with multiple indoor head configurations. These systems are designed to function with 1 single outdoor condensing unit with a minimum 2 indoor units up to 4 indoor heads maximum. (See Match up chart online at www.ideal-air.com, this will also be listed on the packaging of the box). 208-230V, 1ph, 60Hz, 25 Amps and 1970 watts. Outdoor ambient cooling operating temperature range -13°F to 122°F, outdoor ambient heating operating temperature range -13°F to 86°F. Line set size depends on the indoor wall mount or ceiling evaporator head. Ideal-Air Pro-Dual 24,000 BTU Multi-Zone Heating & Cooling Ceiling Mount Cassette with grill. The Ideal-Air Pro-Dual Indoor Head unit can me matched up with multiple different configuration with 1 single outdoor condensing unit. (See Match up chart online at www.ideal-air.com, this will also be listed on the packaging of the box). 208-230V, 60Hz, 1ph, 3 speed fan, 43 dB sound rating, 17.5 Amps and 42 watts. Line set connection 3/8 x 5/8 inch. 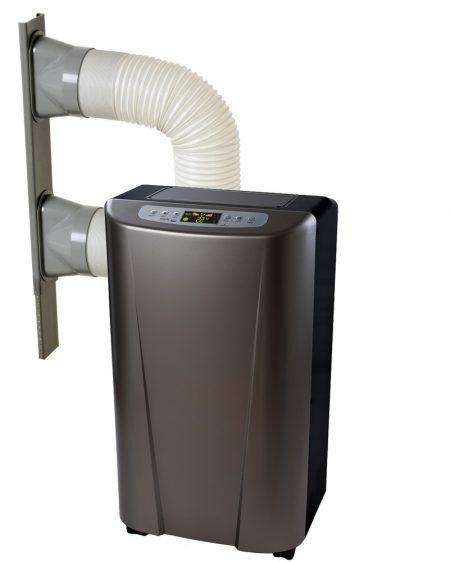 Ideal-Air Pro-Dual 24,000 BTU Multi-Zone Wall Mount Heating & Cooling Indoor Head. The Ideal-Air Pro-Dual Indoor Head unit can me matched up with multiple different configuration with 1 single outdoor condensing unit. (See Match up chart online at www.ideal-air.com, this will also be listed on the packaging of the box). Maximum cooling area up to 484 sq. ft. 3 speed fan, 35.5 dB sound rating, 208-230V, 60Hz, 1ph, 0.45amps 120watts. Line set connections 3/8 x 5/8 inch. Ideal-Air Pro-Dual 36,000 BTU 22.5 Seer Multi-Zone Heating & Cooling Outdoor Unit. The Ideal-Air Pro-Dual Outdoor unit can me matched up with multiple indoor head configurations. 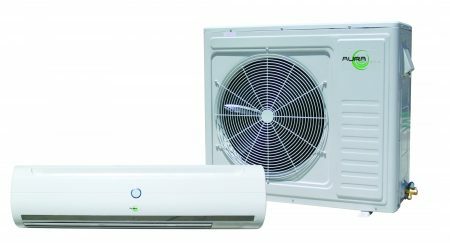 These systems are designed to function with 1 single outdoor condensing unit with a minimum 2 indoor units up to 4 indoor heads maximum. (See Match up chart online at www.ideal-air.com, this will also be listed on the packaging of the box). 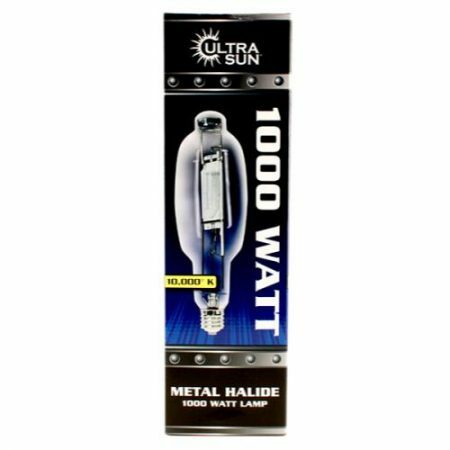 208-230V, 1ph, 60Hz, 30 Amps and 2600 watts. Outdoor ambient cooling operating temperature range -13°F to 122°F, outdoor ambient heating operating temperature range -13°F to 86°F. Line set size depends on the indoor wall mount or ceiling evaporator head. Ideal-Air Pro-Dual 48,000 BTU 21.5 Seer Multi-Zone Heating & Cooling Outdoor Unit. The Ideal-Air Pro-Dual Outdoor unit can me matched up with multiple indoor head configurations. These systems are designed to function with 1 single outdoor condensing unit with a minimum 2 indoor units up to 5 indoor heads maximum. (See Match up chart online at www.ideal-air.com, this will also be listed on the packaging of the box). 208-230V, 1ph, 60Hz, 35 Amps and 3040 watts. Outdoor ambient cooling operating temperature range -13°F to 122°F, outdoor ambient heating operating temperature range -13°F to 86°F. Line set size depends on the indoor wall mount or ceiling evaporator head. 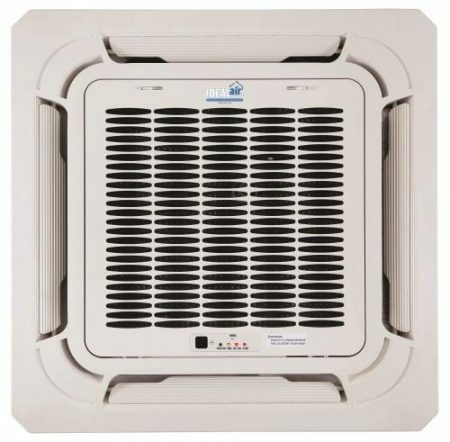 Ideal-Air Pro-Dual 9,000 BTU Multi-Zone Heating & Cooling Ceiling Mount Cassette with grill. The Ideal-Air Pro-Dual Indoor Head unit can me matched up with multiple different configuration with 1 single outdoor condensing unit. (See Match up chart online at www.ideal-air.com, this will also be listed on the packaging of the box). 208-230V, 60Hz, 1ph, 3 speed fan, 37 dB sound rating, 15 Amps and 46 watts. Line set connections 1/4 x 3/8 inch.